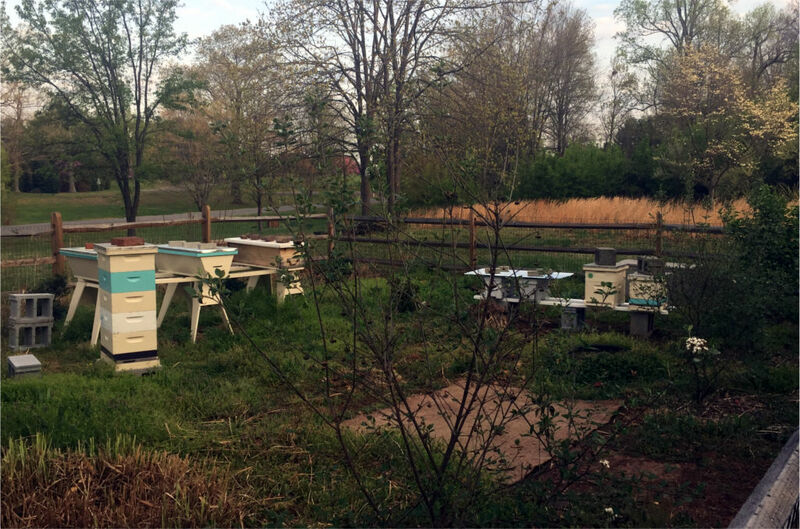 In the month of April I have grown from four to eight hives. I have placed another top bar in service, and split Ganymede four ways to create a couple nucs and fresh hives. I am not sure which ones have queens, and am worried one or more are on the verge of swarming. That, and the zipper on my bee jacket broke. Read on for the detailed account. In my post on April 4, I mentioned that Ganymede has some queen cells so I put a new nuc together. I was sure our sub-freezing temperatures the following week would kill it off. 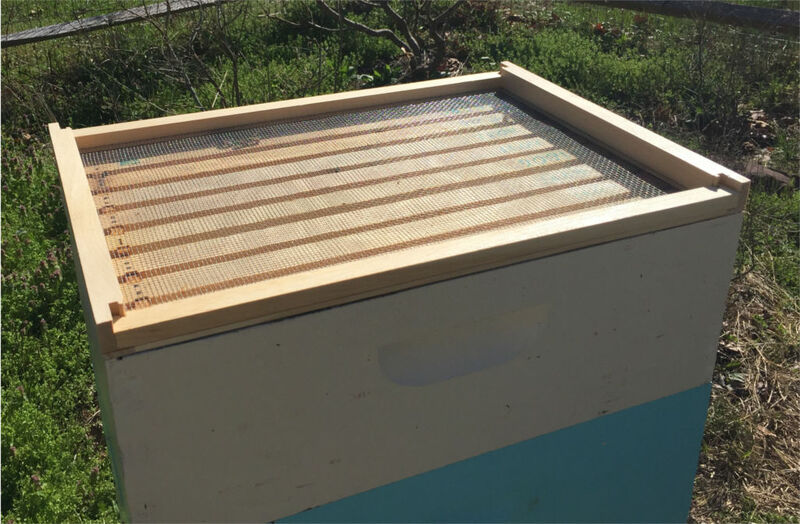 A thin cardboard box with less than four frames of bees does not a warm hive make. So I was quite surprised to find it still alive on April 7 when I went out to gather the presumed-dead box. I pulled the top off to find bees crawling among the frames. So I closed it up, added the insulation above and below as shown in the picture, and left it alone. I have since added a frame each weekend to make sure there was plenty of food and bees. The original queen cells I placed in the nuc may or may not have emerged, so I am not sure whether this hive has a queen yet or not. I had intended to create new queens from Saturn. My big top bar hive has been gentle and prolific, and should have some good genetics to carry forward into new queens. Of course, the bees had other ideas. Ganymede was creating queen cells and filling every corner of the box, even after adding a medium super on April 2. Ganymede overwintered extremely well, and expanded really fast last year. Her bees have always been a little aggressive, so I have sometimes shied away from checking her. A good queen otherwise, so growing from her is not terrible. Unsure what to do, I went extreme and moved Ganymede to a completely new spot. 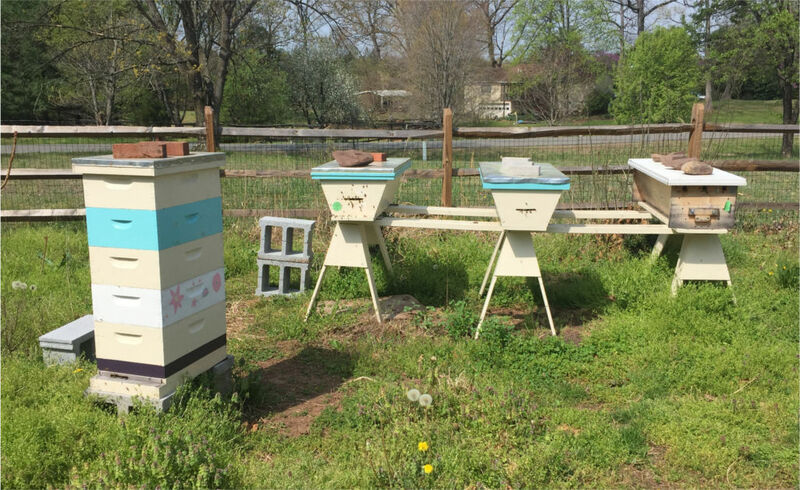 I placed a new top bar hive in the old spot for the foragers to return to, and set up a new hive stand on the side of my apiary. Here I created a new nuc (New Nuc B), kept the existing nuc (New Nuc A), and split the two deep boxes from Ganymede (Gany 1 and Gany 2-3). It seemed like a good idea at the time, though in retrospect it might have been better to simply place the two Gany boxes and find the queen before creating another nuc. The new top bar is 4 feet long, and I really wish I had swapped combs with Saturn to put the longer hive on the end (Saturn is 3.5 feet). I may still do this, as reaching across four feet of space to inspect the middle hive in the future does not seem like fun. The bulk of the foragers from Ganymede came back to Ganymede’s original spot, of course, and were very confused. Eventually they entered the new top bar hive, where I also placed three combs including a queen cell from Saturn to get them started. I separated each comb with an empty bar, figuring they would draw out comb between the existing bars. So that was the set up on April 9. 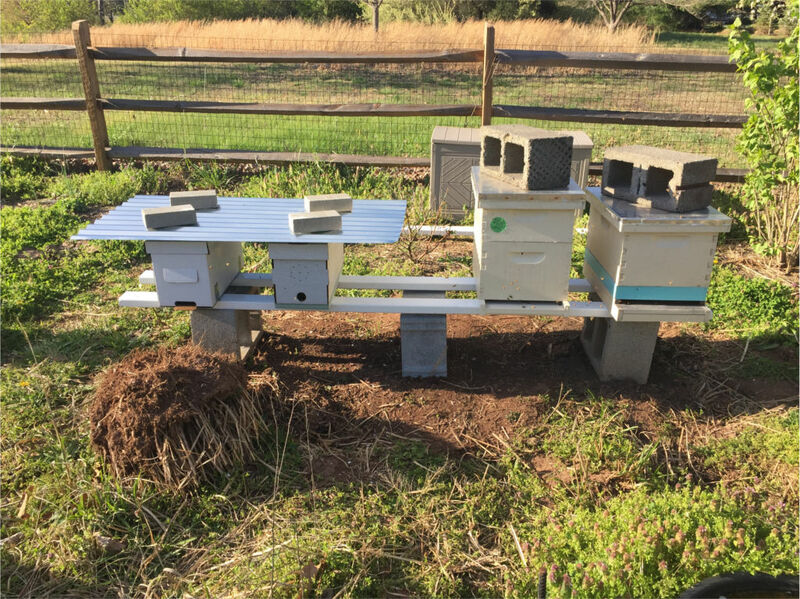 I had a new top bar hive and split Ganymede into four hives. Meanwhile, my all-mediums hive Mars was good. I did a reversal on March 25 and added a new super of foundation. Since then she has filled the third box with nectar and is building comb in the fifth box on top. On April 9 the brood nest was in the center four frames across the two bottom boxes (so 8 frames total). Venus is mostly fine as well. There is brood throughout the hive, with tons of drone brood, and I wonder if she might try to swarm. This is the first top bar hive I purchased, and I bought a new Russian queen for her last year (I saw this queen on April 9). I have been inserting empty bars into the brood nest to help discourage swarming. I’ve had occasional problems with the top bars falling apart and dropping comb to the floor. This happened with two frames last weekend (April 16). One was mostly drone brood so I just took it out; the other had worker brood so I placed it in the back of the hive. I still need to remove this. So along comes April 15 and I check the new hives. I knew I was in trouble when I found fresh larva in New Nuc B. Ganymede’s queen had ended up in this cardboard box. The hive looks good, it is just in a small five-frame nuc box. 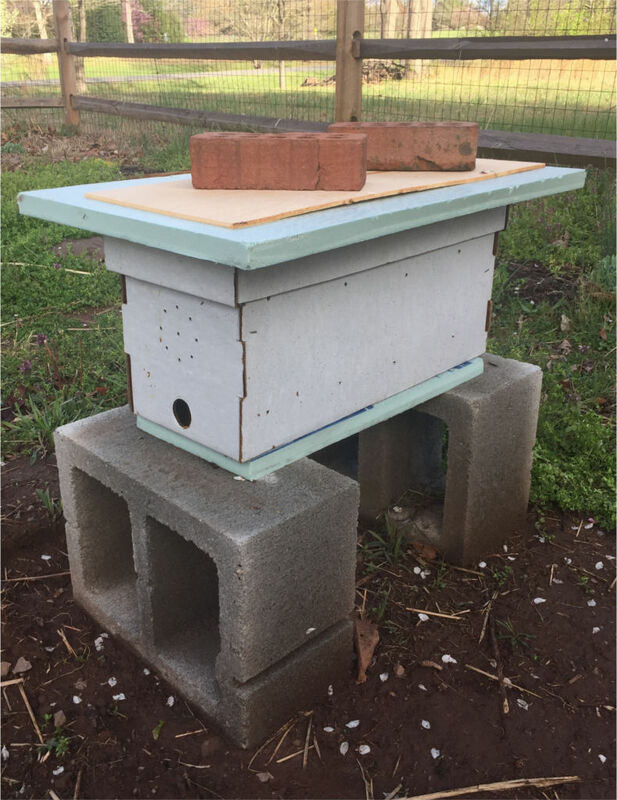 I was afraid to move boxes around at the time as the other hives should be making new queens; though I later realized that I could have kept the frames in the same place and simply moved the boxes. Oh well. I was fortunate to find the queen on a frame, so I moved a different frame with capped brood and queen cells over to New Nuc A. That nuc seemed okay, though I wasn’t sure if she had a queen yet or not. I didn’t see one, which is why I added the a frame. Meanwhile, Gany 1 had four meager frames of bees and no queen cells. Had the queen already emerged? Could she be out on a mating flight? I couldn’t find her, and wasn’t sure what to do with the box at the time, so I closed her up. The other box, Gany 2-3, had a medium super fairly full of nectar and with five frames of bees. The bottom deep had 6 frames of bees and no queen cells. So a good number of bees, and again I’m not sure of the queen. Again at a loss, I closed her up as well. At the time I felt like I messed everything up. The queen was in the wrong box and no idea if the other boxes would survive or not. Which one do I call Ganymede? Is it the old box, or the nuc with the old queen, or the old location? In the past week I have realized that the bees will make do and I can sort out names later. I look forward to checking them again when the warm weather returns. In the top bar hives (other than Venus), Saturn had brood across most of the bars. Some queen cells (or cups?) as well, which is why I was worried about swarming this past week. I was also reminded of a lesson on placing empty frames. If you create empty space next to an uncapped frame, the bees will make the uncapped frame really, really wide. On April 15, a number of the frames were extended only at the top to create a very wide nectar area and a top heavy frame. I added some spacer bars, though the frames are heavy and awkward and I’m not sure what to do about them. There are so many bars like this so I will figure something out. I moved a frame with some queen cells over to the new top bar, just in case it was needed. Speaking of the new top bar hive, it was a bit of a mess. I set it up with around 8 bars in front of the follower board. There were so many bees, presumably mostly old Ganymede foragers, that they were working on both sides of this board. That was easily fixed by moving the follower board back. The front of the hive was a mass of comb, I should have taken a picture. I didn’t want to destroy any potential new queen so I left it all alone. Sigh. I expect to have some clean up work when I can get back into the hive. Hopefully they will have a queen by then as well. Then she gets a name and I can sort out the comb. So that is where things are. We are due for cool, rainy weather the next three days. Maybe I’ll sneak out of work and check the hives later in the week, or just do it next Saturday. Hopefully the bees will adapt to my mistakes, and I can clean up what is left next weekend. While I was disheartened at first, reflecting on my foibles this past week has made me more accepting and hopeful. Always something to learn. I had an uplifting line ready for this post, alluding to buzzing bees in spring. Then I wrote the post it didn’t really feel very uplifting or springy. So I went looking for a “grow” quote since my hives have grown from four to eight, and found this one on Free Dictionary. With our weather dropping towards 50 F (10 C), the springtime quote will have to wait. As I mentioned, I have a been a little discouraged lately. I feel rushed in the bee yard and my efforts do not quite work or look or work out the way I had hoped. It is part of learning to be a beekeeper, I am sure. With time the bees make do with my fumbles, and one day I will be more experienced and sure in my manipulations. So the title is perhaps a prophetic and hopeful wish for this beekeeping endeavor of mine, as much a reflection of my growing apiary. Great descriptions and great photos! I may have missed it, but is Ganymede a split from a hive called Jupiter? And by Jove, the nucs of Ganymede should be renamed to reflect (as yet undiscovered) orbiters of the red planet’s own biggest satellite. Seriously, thanks for sharing the nuc business with us.I’ve never kept TB-hives so it’s also interesting to see what’s happening there. Finally, I’ve got to say that you have a great-looking bee yard! Thanks, Ron. Yes, I split Jupiter last year to create Ganymede, and Jupiter swarmed anyways to create Saturn. I wait to name until there is a viable queen, and I haven’t decided what to do with nucs that I may end up selling. Such dilemmas! Yes, the bee yard is nice. Constrained in size, though nice to have near the house in easy walking distance. I often walk by after work just to check on their progress. Thanks again.